Viewing Post: Is Your Website ADA Compliant? Here at ThinkSEM, we focus mainly on pay-per-click marketing and custom web design, but one of our core services has always been search engine optimization (SEO). What does search optimization have to do with accessibility? Well, in order to have a website that’s accessible to those with disabilities, the site is also well optimized for organic search. But this means certain steps need to be taken to ensure screen readers can tell these users what’s actually on the page — anywhere, whether it’s the content, a headline, an image or even a video. For those who don’t know, screen readers assist visually impaired people to decipher what’s on a web page. From the Bureau of Internet Accessibility, screen readers are software programs that convert text into synthesized speech. They can also contain Braille technology. Screen readers are software programs that read the content for visually impaired users. They don’t just read off the “regular” content, they also tell the user about the website’s navigation. …in essence, the hierarchy of content. It tells the user all of this so that reader knows the different sections of the website, as a sighted person would by looking at the design layout. On an inaccessible website, however, the screen readers can’t see the major areas. In fact, they have to read all the content on the page from top to bottom, with no “weight” given to more important information (headlines, banners, etc.) versus the normal content areas. They have to “discover” the page one word at a time, which is very time consuming for the user. As long as your website makes content accessible to the screen readers to pull content from, the usability should be good for those with no or low vision. Back in 1990 when the ADA was in its infancy, “accessibility” referred to physical access to public places; not the Web. Since the Internet has evolved into a universal space in which to conduct business, it’s imperative that businesses create websites accessible to everyone. 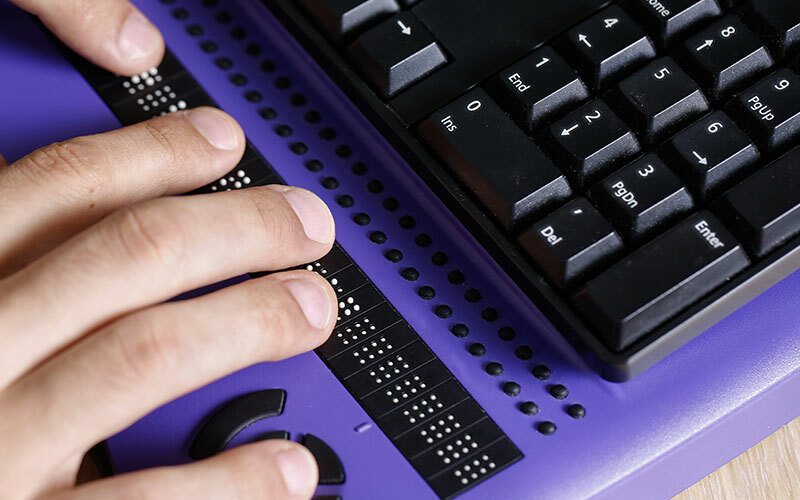 Here are a few pointers on how to ensure your existing website content is accessible to those with disabilities. …but oftentimes, with an entire website to optimize, little details can get overlooked. Especially when you could have hundreds of — if not more — images on your website. Ha. Even if it’s something as simple as “office dude looking in a huge binder,” or something to that effect, put something descriptive in your ALT text area so everyone knows essentially what the image is. Text captions for videos — this isn’t a search engine optimization must-have, but it helps screen readers decipher audio. For instance, if you don’t include captions, then a deaf person wouldn’t be able to access your video content. Having captions is nice for those who simply don’t want to listen to a video, but would rather read the information. It’s important to go beyond merely giving your video a good title; you should also be providing a text document of what’s included in the content. Transcriptions — the easier way (but not necessarily quicker) to make videos accessible to anyone is to fully transcribe them. A great example of how this is done well is over on Moz — their Whiteboard Friday videos are super educational, and fun (who doesn’t like watching Rand smile that cute smile? ), but what’s even better is when I can’t watch the videos, I can just scroll down and read the entire transcription. We’ve talked about color contrast as it pertains to calls-to-action before; it’s not just a good idea to get more conversions, it’s important for people who might have trouble distinguishing between colors, too. This isn’t just about the color palette of your website — please don’t think that light grey text on a white background is easy to read for anyone! As I’ve mentioned myriad times before, using online forms to capture leads is paramount to lead generation success. I.e., filing taxes online, or purchasing goods on a website. But, are your forms ADA friendly? According to the Americans With Disabilities Act, a big deterrent online for the disabled is forms that aren’t labeled well, or those that use CAPTCHAs. Not being able to fill out a form to send in their information means these people are denied the ability to convert. That means they can’t get what they need, and you miss out on leads — that’s a lose-lose situation. Basically, any business that serves the public is subject to ADA requirements — read: any company with a website. So, here are some things you should definitely not be using on your website if you want to adhere to accessibility rules. Why? Why shouldn’t web masters use PDF format? **Most** often, people create PDFs in the old-fashioned way, which is an image-based format. While search engines don’t have any problems “reading” this format (anymore), screen readers still can’t. Plus, ask yourself why you’re creating online content in PDF format anyway. Is it because it’s easier to print out? Why is that important? Why not just create a webpage dedicated to that topic? It’s friendlier to search engines and users alike (and we all know how much Google likes it when websites cater to users), especially since so many people are accessing the web on their mobile devices these days. Plus, here’s a helpful hint: PDF isn’t mobile-friendly. If you insist on using PDFs — for whatever business objective they fulfill — just be sure to save them as text files and not images. This antiquated form of web design isn’t as big of an issue anymore — or shouldn’t be — like back in the day when I first entered the SEO world, but nesting tables are still in use. And, they pose a huge UX barrier! Not just to people with screen readers; search engines (still) don’t like them, either! Plus, if your website is still built in table format, you need to leave the 1990s and enter into the 21st century, so please give us a call. Post haste. As I mentioned earlier, the basic information you add to your site’s code for SEO is actually helpful for all users — including those using screen readers. By clearly delineating the title tag, meta description, and other on-page data — such as headers, bulleted lists, even bold and italicized content, etc. — you can lay out a hierarchy of content that’s easy to decipher for any type of user, and of course search engines. And, naturally, image ALT text falls within this category. So you’re jumping on the video bandwagon and have great content online for potential leads. After all, it’s a visual world we live in, and video marketing caters right to that niche. But, is the video on your website accessible to everyone? If you’re not transcribing it, then no. Especially when you create the content for the video yourself, it’s so absolutely easy to throw a transcription on the page for ease of use (for everyone, including search engine crawlers, screen readers and those people who just don’t want to listen to audio). This might not be something many webmasters think about, but what about those people without the proper motor functionality to use a mouse to navigate the web? If all websites are built with the use of a mouse in mind, then many people online will be denied access to your website’s content. W3C mentions a website with full accessibility won’t rely on a mouse to navigate; rather the user can utilize input from the keyboard to move about a website and reach content areas. While using CAPTCHA code within online forms to deter spam is pretty commonplace, it can be a huge barrier to people using screen readers. Not only trying to decipher the squiggly numbers and letters, but even poorly labeled areas of the online form can deter those who depend on screen readers to contact you. I can’t imagine what that other 30% is thinking by sticking around on a website that isn’t easy to use — other than they must be so accustomed to not experiencing good UX they don’t leave because where else can they go? Which is really frustrating to think about. Create a website that’s friendly to all — it only makes sense in today’s online-heavy world. Again, I can’t stress enough that when a website offers up a good user experience, people and search engines love it. So, by taking little steps to ensure your website is accessible to those with disabilities, you’re also making it easy to use for everyone online. It’s a win-win.